Lawrence’s Complete Source for Massage Therapy, Chiropractic, Acupuncture, Skin Care & Waxing! 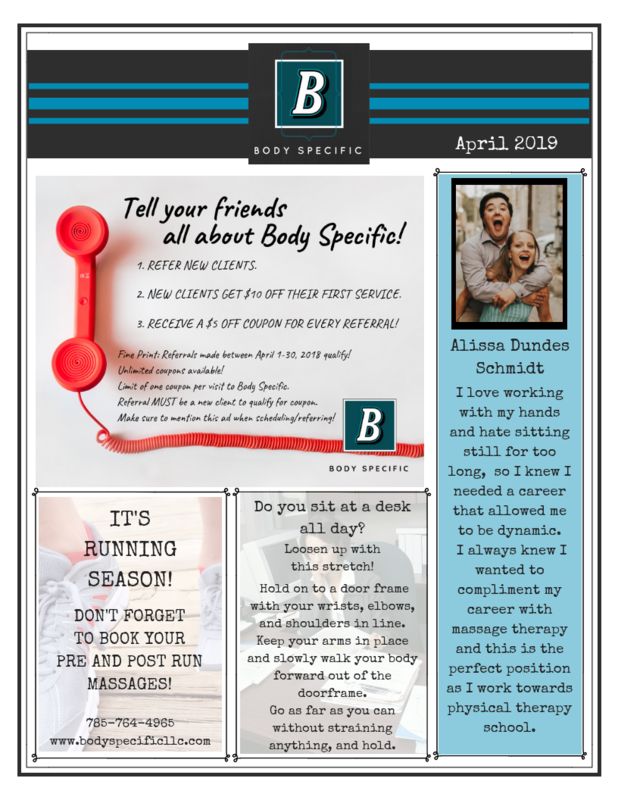 At Body Specific, we enable our clients to achieve and maintain a whole health lifestyle by incorporating massage therapy, chiropractic, acupuncture, waxing and professional skin care into a comprehensive wellness plan. 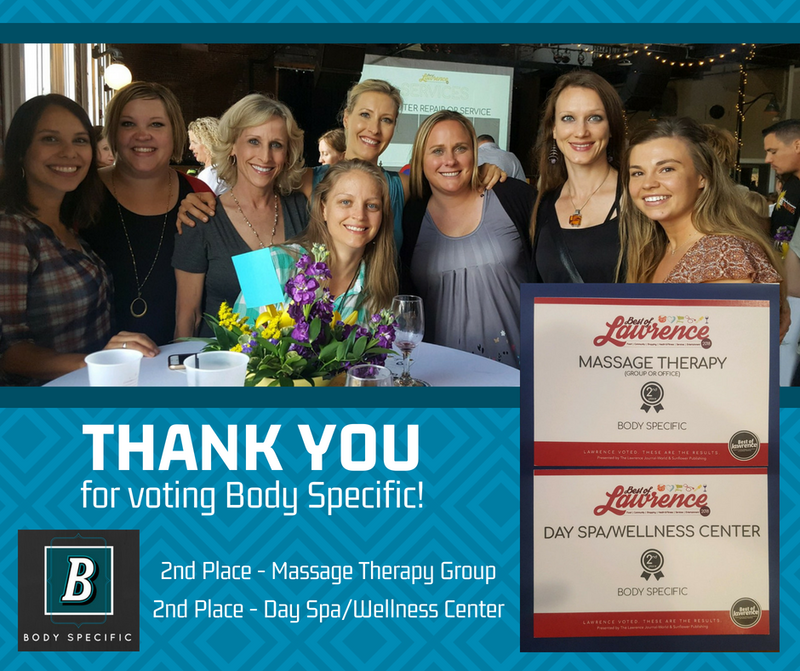 Co-founded by Lisa Lahm and Leah Henderson in 2013, our experienced Certified Massage Therapists, Licensed Chiropractor and our Licensed Skin Care Expert offer customized services geared to each client’s individual health goals in a comfortable, relaxing, and caring environment. Specializing Trigger Point Therapy, Reiki, Deep Tissue Massage, Swedish Massage, and Reflexology, our staff of trained professionals can provide the exact treatment that is best for you. Body Specific offers professional skin care services and full service waxing, provided by a Licensed Esthetician. Our waxing services include eyebrow, leg, lip and face, bikini, Brazilian wax and much more. Every skin care service we offer is customized to treat and address your individual needs. Body Specific is an Image® retail location, right here in Lawrence. Chiropractic care, like acupuncture, it has it’s roots in ancient Chinese medicine whose history goes back thousands of years. These modalities remove pressure and stress from the nervous, circulatory, and lymphatic systems to allow proper muscle contraction and relaxation, optimal organ function, and a full range-of-motion. Freedom of movement and body function is the basis for human health. Much pain relief and permanent correction can be obtained by the use of chiropractic adjusting and acupuncture therapy. Chiropractic and acupuncture go hand-in-hand with massage to provide relief from many ailments and improve overall quality of life in all individuals. The professionals at Body Specific are passionate about improving our clients’ overall well-being. We are conveniently located on West 6th Street, south of HyVee, in Lawrence, KS. Contact us to schedule your appointment today – We look forward to working with you!